The 45th running of the C.R. 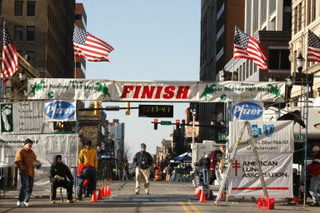 Half Marathon took place on March 9, 2008. Rebel male and female teams each captured medals in cold, windy conditions! The 5th annual pre-race pasta dinner was held in "The Beer Room" at Tuckin's house, where guest chef Sit-Down fed us well. Rebel Staff and Rebel Lips teams each fielded 7 runners, but brunch waiting at Fair Weather's place, we didn't stick around for the ceremony at the frigid, windy finish line. Tex had a great CR debut! Here are my thoughts about running my first half en route to my first full! 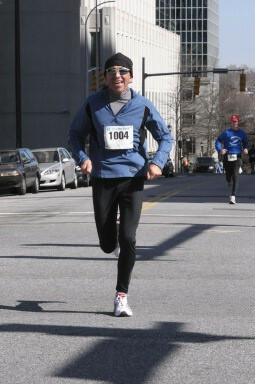 Having never run a race that was longer than 10K I did not have any idea what to expect from the CR half marathon. I was excited for many reasons though! This was my first half, my first CR, my longest run to this point, my first "race" back after I took time a year off, etc. 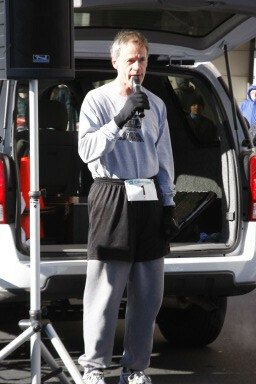 I am so thankful to all of the rebel runners who kindly offered me their advice before the race. Dan (megaphone) was kind enough to give me a goo to try during the race, Kelly and Jack were gracious hosts before the race, the list goes on! Without every one's help I would not have been as relaxed and comfortable at the start or during the race as I was. The wind was awful, and of course was strongest when I was climbing the hill to the turnaround! 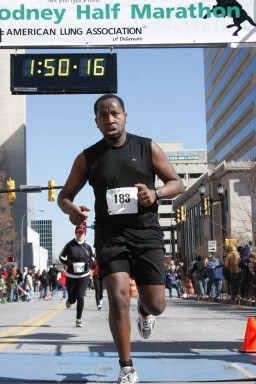 The last hill to the finish is infamous, but I survived it all! I went out slow and came in fast (1:27.14). 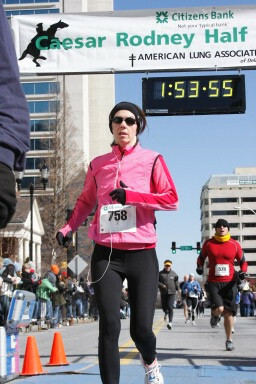 It was a perfect run- I could have gone faster but that is exactly how I wanted to feel! Thanks also goes out to Heather for having everyone over after! I again was able to recover in the presence of fellow runners and share a good laugh or two about our finisher cup! I am already signed up for the OC half where I hear there is a good chance to PR (under 1:20?!) and again Lori is graciously going to play host! I expect great things from that half, and from my first full back in Wilmington on May 18th! Just click on the 1st link down below and check it out! "Either I've been spending too much time in the tanning salon or my timing chip got mixed up with Sammy's." i was browsing thru the pictures from CR this morning, and when i type my name for the photo search, BBQs pictures show up! then i typed his name and my pictures show up! 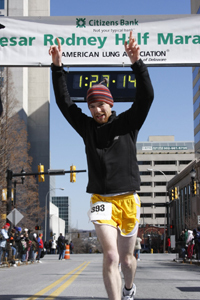 also for the results they have me listed with a gun time of (1:53:00) but on my picture at the finish line the giant clock is clearly showing 1: 50:16 as the gun time. who knows what the hell is happening? rigging? i will start rioting! i demand a recount or an election that is free and fair!!! hahahah! Chip-switching is becoming all too common among Rebels. We must put an end to this illegal practice (which of course all started in Virginia Beach). I brought the bags intact with their correct chips and beer ...I mean bibs... to Criminalowitz's place Sunday morning. He just happened to be the first to break the news to me so clearly he was involved. I don't remember who arrived first, but apparently, neither of the victims of this outrageous crime looked for their name. They just dove in for the almighty chip. Let this be a lesson to all. Verify things like this, since you could also be helping someone else avoid grief and heartache (and ribbing). Criminalowitz will pay for his complicity by picking up the medals won by our mighty Rebel teams (although I believe only the 5 scoring runners from each team get one), so show up next week if you can claim one. ...but you'll need to produce 2 picture id's to confirm your legal identity! After doing a little investigating of my own, I now know who is behind all of this chip switching. I asked my self a few questions. 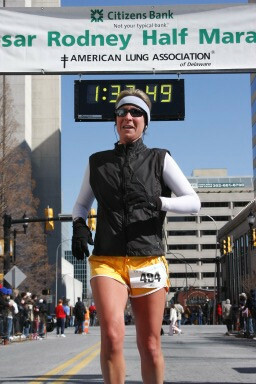 Who was at the Virginia beach 1/2 marathon(Tricia, Rich Dan Tuckin)? Who was in charge of chips for CR (Tuckin)? That's right!!!! Tuckin you are the mad chip swapper!!! CASE CLOSED!!! !